Top seed Elena Dementieva displayed her class and was hardly pushed throughout her two-set encounter with Magdalena Rybarikova. The Russian triumphed in just 1 hour and 2 minutes to win 6-0, 6-3, setting up an exciting semifinal match against no.6 seed Sybille Bammer, who overcame Chang Kai-Chen 6-3, 3-6, 3-6. In another match yesterday, Ayumi Morita played strongly to defeat Chanelle Scheepers 6-3, 7-5 and progressed to the other semifinal where she will meet Alisa Kleybanova who defeated Anastasia Rodionova 4-6, 6-3, 6-4. In doubles, second seeds Chan Yung-Jan and Zheng Jie booked their place in the semifinals after overcoming Vitalia Diatchenko (RUS) and Chanelle Scheepers (RSA) 4-6, 4-6. Here's the complete results for yesterday. Today’s singles semifinal matches will see Alisa Kleybanova take on Ayumi Morita at 2pm on Centre Court. 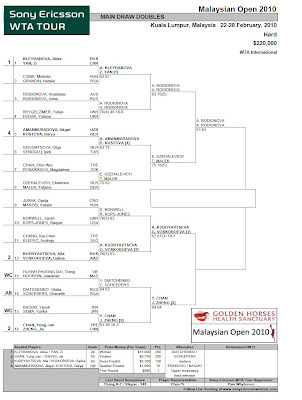 That match will be followed by the second singles semifinal featuring Elena Dementieva and Sybille Bammer. The final match of the day will see a doubles semifinal between the pairing of Chan Yung-Jan and Zheng Jie against Alla Kudryavtseva and Galina Voskoboeva. 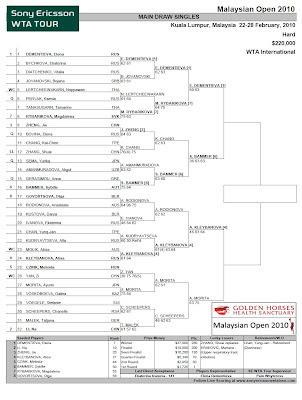 The winners will play against sisters Anastasia and Arina Rodionova. Click the following image for the OOP on Day 6.